SHOW BRAZIL PRODUCTIONS PRESENTS Brazilian Carnaval 25th Anniversary "Let's Celebrate"!!! Celebrating 25 years of tradition and authenticity. Show Brazil! is the longest running Brazilian Carnaval celebration in the Pacific Northwest. Celebrate with Eduardo Mendonça, Show Brazil! band, VamoLá, Show Brazil singers and Show Brazil Dancers & non-stop Carnaval music & dancing. 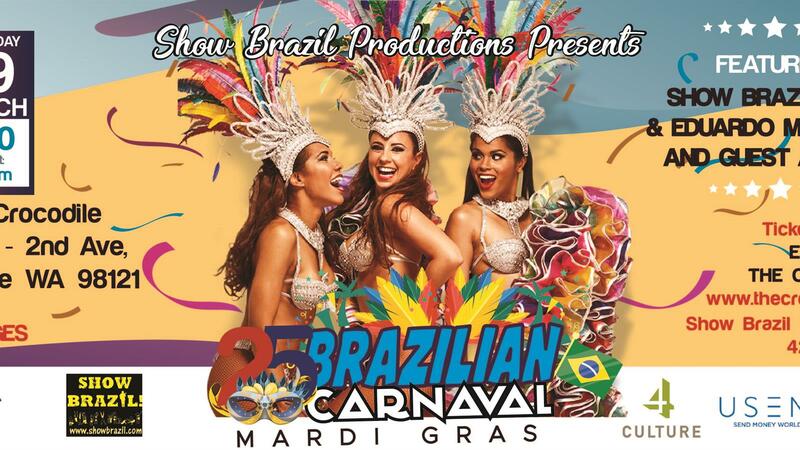 Are you ready for our 25th Annual Brazilian Carnaval/Mardi Gras Show Brazil! 's band is known to feature in one night, the Brazilian Carnaval music and dance from each region of Brazil. Show Brazil!The soul of the Brazilian culture in a highly energetic performance.Our History: Show Brazil Productions promotes Seattle's Traditional Carnaval since 1995 ( always SOLD OUT house ) led by Brazilian-American first generation immigrants Eduardo and Ana Paula Mendonça. ALL AGES! !